By December of 1914, Britain and Germany had been fighting against each other in World War One for five months. On Christmas Day, something amazing happened. Soldiers on both sides temporarily stopped fighting and enjoyed a day of peace. It all started on the morning of December 25th when the German soldiers climbed out of their deep trenches and crossed the battlefield. “Merry Christmas!” they shouted towards the British. Although the British soldiers did not trust the Germans at first, they did not shoot. Slowly, the British understood that the Germans wanted a short truce to celebrate Christmas in peace. After a short talk, the British soldiers agreed to it and put down their rifles. Both sides exchanged small presents and cigarettes with their enemies. The Germans and British agreed to let each other collect their dead from the area. A German soldier who was a barber before the war gave a British soldier a trim. One of the British soldiers brought out a soccer ball and both sides kicked it around. The Germans and British stopped fighting for most of the day. Some people got very unhappy about this. The leaders on both sides were especially furious. They wanted the men to keep fighting, even on Christmas. Newspapers did not report about the truce until a week later. In the next few years of the war, there were some Christmas truces but not as many as 1914. However, the Christmas Truce of 1914 is still remembered today. It is an example of how people can stop fighting and come together in peace. 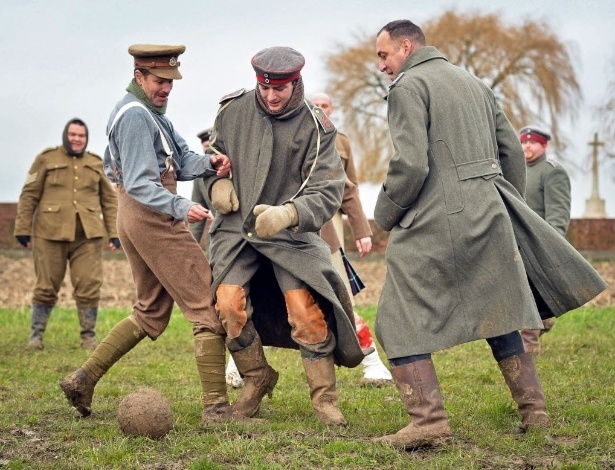 What really happened in the Christmas truce of 1914? 1. According to the article, what happened on Christmas Day in 1914? 3. According to the article, what happened on the morning of December 25th? 5. What did the British and German soldiers allow each other to do? 7. According to the article, what happened in the next years of the war?